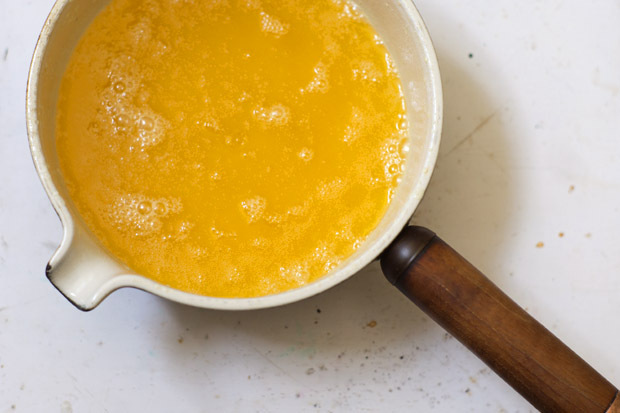 Ghee is also called clarified butter. It is basically butter that has had all the milk solids cooked out, and therefor is pure butter fat / oil and lasts a very long time without spoiling. It is amazing for cooking because it has a really high smoke point, which means it doesn’t oxidize and break into free radicles in your body like other oils that are cooked at really high temperatures (such as vegetable oil or olive oil). Is also not an issue for dairy intolerant people because you cook off all the milk and dairy solids so the final result is free from any dairy. Contains butyric acid which protects your immune system by feeding the beneficial bacteria in your gut and helping them to protect you at a gut level. Stimulates your digestive acids and juices so it kick-starts your digestion. It also contains MCFA (medium chain fatty acids) which is also in coconut oil, this type of fat is not stored in the body it is used for energy. Rich in vitamins in grass fed butter such as vit A, Vit E and K2 also CLA which is an antiviral antioxidant. Ghee is a power house for your health and is super gentle on your digestion and your gut. I highly recommend using it, plus it has the most lovely caramel flavor and scent. You can store it at room temperature in an air tight container for months. I make ghee in big batches, 8 to 10 pounds at once. This recipe will be for two pounds. Place butter in Dutch oven or a thick bottomed saucepan. 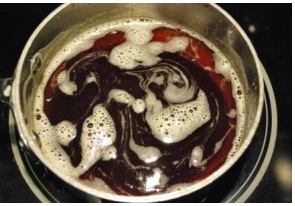 Cook for about 10-15 minutes on medium –high heat, you want a rolling boil, not just a simmer. I over brown my ghee, I love that nutty flavor. Let it boil until it is darkened, see photo below. Then slowly pour through the wire mesh strainer lined with several layers of cheesecloth. Put a little water and dish soap and bring it back to a simmer, this will help loosen the milk solids that have burned on to the bottom.